This past Friday and Saturday members of the BCCCB participated in a car show and swap meet at C200. 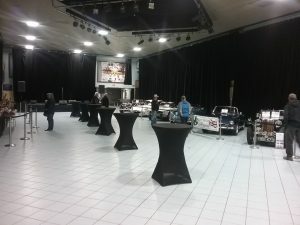 We had been invited to participate by the Custom Cruisers car club who wanted 6 – 7 of our cars for a display in the upper concourse area. Because of the limited space available, they only wanted a small number of cars. I selected seven of the chrome bumpered vehicles to form our display. As you can see from the pictures we were front and center during the meet and greet social events as well as being located at the main entrance to the show. Because this was their first attempt at using a venue like C200 the group was testing the waters to see how things would go. I think it went very well and their President was very appreciative of our co-operation. He invited our entire club to participate in the event they are planning for Charlotte Street in the late summer. Special thanks go to Peter Smith, Barc Cunningham, Ray MacIsaac, Joe Renzi, John Inch and Carol Miller for attending. Bob Jardine was not able to attend because of mechanical issues but he tried. 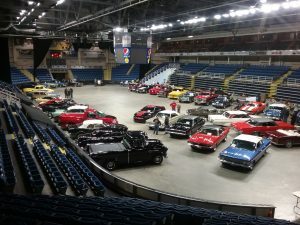 The next event is the Emera Center show in North Sydney, June 16th. We have 10 spots reserved inside and those vehicles go in on Friday night June 15th. 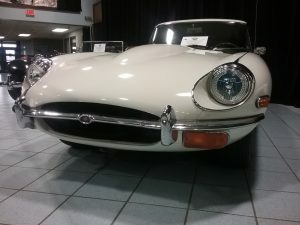 Thanks to Don (write-up) and Pete (photos) for covering this event for the site!